In order to help preserve the shine and beauty of your trio ring wedding set, it is important that when entering a hot tub or swimming pool that you take all your jewelry off (and store it in a safe place!) This is because chlorine can have a damaging effect on gold and platinum and has been known to slowly erode the finish and polish of gemstones. Chlorine has also been known to slowly damage and discolor precious metals, especially gold and platinum. 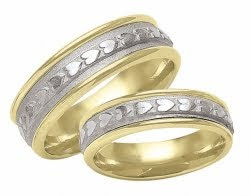 Similarly, we recommend that you take off your wedding rings before jumping into salt water, since it has been known to have a very similar effect on gold jewelry. Another reason we recommend taking your rings off when our in the sun this summer is that applying lotions and sunscreen can also damage your rings. These products have a tendency to form a thin coating on your jewelry, which can take away much of the shine and vibrance of your rings. Likewise, to preserve the optimum shine, it's important that you take your rings off before showering and cleaning. While it may seem that it only happens in movies that a ring slips off while cooking or cleaning, or slips down the drain by chance, it could happen to you! Not only are your wedding rings valuable financially, they are also an important emotional symbol of your love.